Improving the efficiency of phosphorus (P) use is a major challenge for agricultural production and sustainability. Using a combination of new and historic data, a mass balance approach was employed to construct and discuss a comprehensive P budget under temperate irrigated grazed pasture that had received different inputs of superphosphate fertilizer for 57 years [nil (Control), 188 kg ha−1 (188PA) and 376 kg ha−1 (376PA)]. Most (97–99%) of the applied P was accounted for in soil storage, plant residues, removal in animal products, excretal transfers, losses via irrigation outwash, rainfall runoff and leaching in the soil–plant–animal system. Management of soil available P that exceed the critical level (17–22 mg L−1) for optimal pasture production can result in low P balance efficiency and excessive soil legacy P in the soil profile (0–1 m). Results of this study revealed that accumulation of P in soil and plants (68–80%), P losses by irrigation outwash (8–11%), and excretal transfers to stock camps (6–12%) were important factors that determined applied P use efficiency. 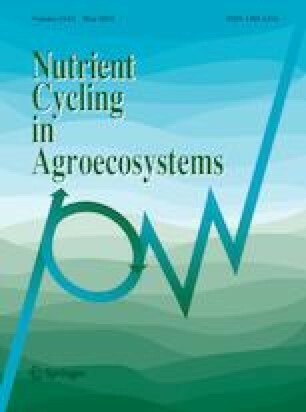 These findings highlight the need to apply appropriate quantities of P fertilizer to maintain optimal soil P fertility, plant growth, and animal production, together with enhanced utilization of accumulated soil P and reduced P transfer in drainage. Funding for this study was provided by the Integrated Demonstration of Key Techniques for the Industrial Development of Featured Crops in Rocky Desertification Areas of Yunnan–Guangxi–Guizhou Provinces, the Agricultural and Marketing Research and Development Trust (AGMARDT), the New Zealand Ministry of Agriculture and Forestry, and Environment Canterbury.